It is with deepest regret that we must announce the cancellation of the World Beer Festival – Richmond 2011. We enjoyed an excellent response from the Richmond beer community to last summer’s inaugural event. As we prepared for this year’s festival, we were excited about the public response, including both ticket pre-sales and volunteer recruitment. However, we have struggled with the regulatory requirements and trade practices in executing our festival model in Richmond. Furthermore, internal company issues inhibited our ability to get ahead of these challenges and respond in a supportive partner fashion. We concluded we could not create the type of beer tasting experience that would meet our standards, a reputation for quality beer tasting events that we have nurtured since 1996. We would not have fulfilled our commitment to our customers or to the industry we have served for three decades. We remain committed to the Richmond beer market – beer lovers, beer retailers, beer wholesalers and brewers – offering our assistance and support for any and all quality beer events that spread the word about good beer. Perhaps in the future we will be able to overcome the challenges and the World Beer Festival will return to Richmond. Again, we are deeply sorry about not being able to execute our event and any unfulfilled expectations that this may cause. We are contacting all advanced sale ticket holders to offer refunds or exchanges for our World Beer Festival – Durham, World Beer Festival – Raleigh or World Beer Festival–Columbia. Now that you have digested that, a few comments. I do not know about the “regulatory requirements and trade practices” that made it difficult to execute their festival model but I wonder where our local government was in all of this. Here was a beer festival that encouraged responsible drinking by limiting sample sizes to 2 oz. Did our local officials see the one price tag as too different from other beer festivals to find a place in this town? Think of all the work that has been done to turn Richmond into a travel destination. Now think of the effect losing this festival will mean for the future. Do not be naive in thinking people to not travel for beer. People do and they would have come here. Richmond beer lovers go to All About Beer Magazine’s website and thank them for last year’s festival and ask them to come back soon. 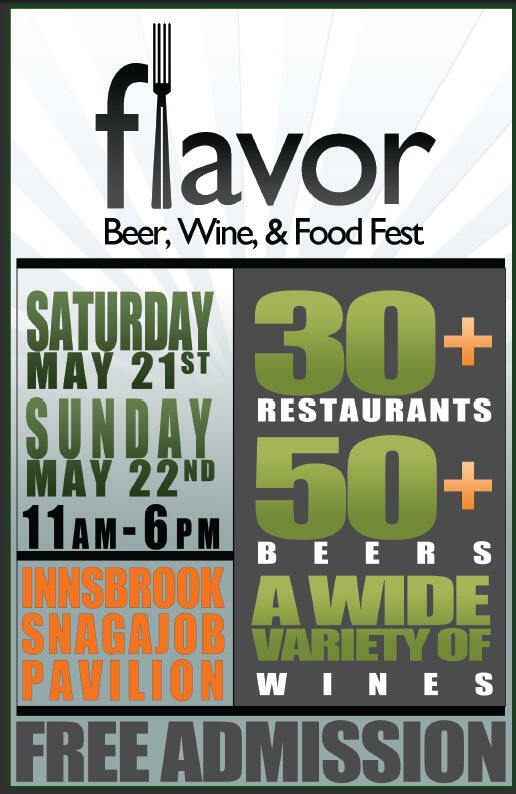 Flavor – Beer, Wine, & Food Festival, a new addition in Richmond’s heavy festival season, will be held on Saturday, May 21st and Sunday, May 22nd from 11am to 6pm at the Innsbrook SnagAJob Pavilion. Now, I have not heard of most of the restaurants listed to be a the event but standouts like Halligan’s, Boka, and Ginger Thai Taste are sure to please. The festival promises a variety of wine and beer. Trying the beers from Pyramid, Anchor, Epic, Duck Rabbit, Thomas Creek, or Highland Breweries would be a nice way to close out our celebration of American Craft Beer Week.